Mix all JV players in until scrimmaging then send all extra JV to help the girls be able to scrimmage. Scrimmage to 5 with Double Score - Work on calling endzone and executing it, work with our 4 JV guys who are going this weekend so they are clear on what to do in endzone, and work on explaining Ho to them as you run it. Zone Scrimmage - Focus on a tight cup and trapping the sidelines, work with JV as needed. Scrimmage - run vert, ho, and zone, and make sure the 4 JV guys coming this weekend have a grasp of everything. We will be meeting at Woodside at 2:30pm on Friday March 30th to head up to Arlington for YHB Invite. Please check the weather and pack accordingly, please try to pack light because we are limited on space in the vans. Please make sure you have your permission slip complete and turned in to Coach Chappell. Girls please have your USAU complete and get your ID number to Coach Chappell by Wednesday. Parking: There is ample parking in the designated lot at the field BUT there is a parking fee. These are metered spaces and you will be required to display a parking voucher that you purchase from a vending machine. The machine takes credit cards. The cost is $1.25 per hour from 8am – 6pm, or $12.50 for the day. Parking is free on Sunday. We understand that free parking is available on the weekends at 2011 11th St, South, walking distance from the fields. Bagels: We will have complementary bagels and bananas for visiting teams at the concession table in the parking lot. We also plan to have coffee on hand for the parents and coaches. HOWEVER, no food or beverages are allowed on the field at any time, including snacks which you or your players may have packed for the game. This includes any snack bars, energy bars, Gatorade, etc. Parking: There is ample parking in the lot entered along Stafford street just past the school. It’s free public parking. You are also welcome to park in designated street spots. Bagels: We will have complementary bagels and bananas for visiting teams at the concession booth. We also plan to sell light concessions snacks a drinks. However food and beverages other than water and Gatorade may only be consumed off the fields or track. You can use the link below to see the schedule for the tournament this weekend. It may change before this weekend as we have requested that the Woodside teams be placed in opposite pools. Scrimmage - work on running Zone, work with JV players to get them in the right place, talk about positioning on O and D and on Zone offense as needed. Mix in some regular vert points as well. Some info for this weekends tournament. We will be leaving immediately after school, we will try to be on the move by 2:45 or 3 at the latest. Be ready to go on time so we can get to NC at a reasonable time. Please pack well but lightly, we are somewhat limited on space in the vans. Things you should consider having: White and Purple jerseys, shorts, compression shorts, socks, cleats, sunscreen, chapstick, water, snacks, clothes for when we are not playing, toiletries, money for food (dinner fri, sat, sun). Check the weather to see if you may need rain gear or extra clothes. We will be practicing this Sunday, March 18, 2012 at 2pm at Woodside. Everyone do your best to be there so we can be ready for our tournament in Wilmington, NC next weekend. JV players your date is less than a week away. Please give the coaches your USAU Id number once you get it so they can add you to the roster. Coach Chappell and Coach Richard. All players need to get their USAU dues paid and the waiver done. This can be done online HERE. You can sign up or renew by clicking join online and logging in, if you were not a member before you can create a new login and get signed up. All players Varsity, JV, and Girls need to do this or you will not be able to play in several of our spring tournaments. If you don't have your USAU done by the date listed about you will not be able to attend the tournaments we are scheduled to attend that weekend. 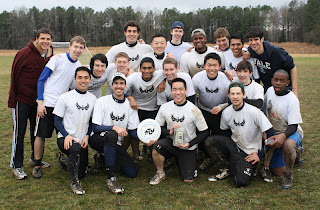 Capital Ultimate Camp will be back again this year. This is a great opportunity to go play some ultimate, get some good instruction, and build your skills for next year. Don't wait until the last minute, start thinking about it now. We hope everyone had a great time a Woodside invite this past weekend, we have no idea how we managed to get all the games in through the rain but we did. Congratulations to Yale Superfly for winning the second annual Woodside Invite!